Le Petit Soyc is an idyllic private escape from every day life, ideal for families or parties of up to ten. As the cottage is surrounded by fields and woodland, the large (10m x 5m) fenced, and optionally heated, pool and multiple terraces are very private and capture the sun day long. Inside, the 18th century stone cottage has been sympathetically converted and updated to create five bedrooms (3 double ensuite and 2 twins sharing a bathroom). The open-plan living area has comfortable leather sofas in two seating areas around the original fireplace, and a well equipped 49 sq m kitchen opening on to a large kitchen terrace overlooking the pool. Outside there is plenty of space for children to run around and the pool is fenced for child safety. Some games are provided, as well as Satellite TV/DVD for UK TV and Radio channels. There is no Wifi/Internet at the property although mobile 3G and 4G reception is good to enable your mobile internet. Located amongst peaceful rolling hills, yet only 60 miles from Toulouse airport, or one days drive from the channel ports of Caen or St Malo. 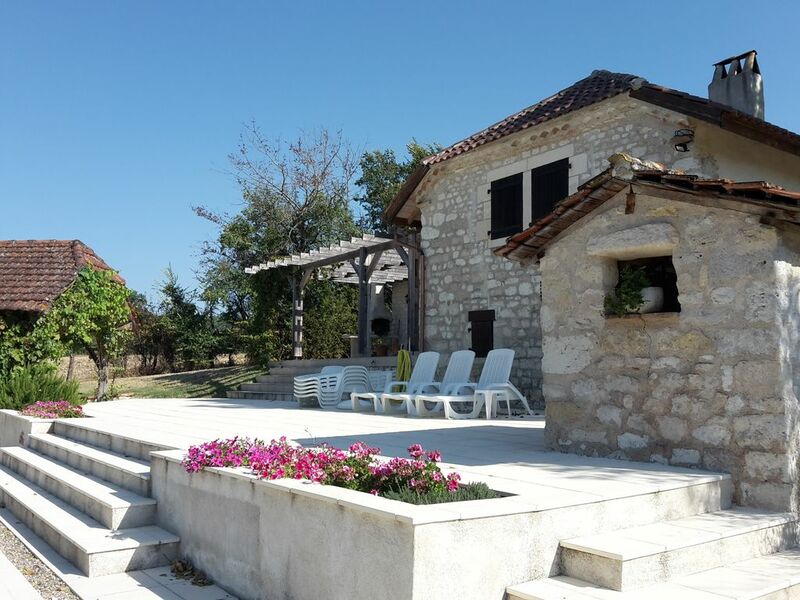 A car is required due to the rural location, however the historic cities of Cahors and Montauban are both within half an hours drive, with many smaller historic towns and bastides closer. For the mildly energetic, apart from the large (10m x 5m) secluded, illuminated and optionally heated swimming pool, Croquet, Table Tennis, and Boules sets are provided. Golf and Tennis are available nearby. For the less energetic, sunloungers, backgammon, playing cards and the barbecue will suffice, with shaded areas available outside as well as lots of sun terrace. Originally a very basic farm cottage, when purchased by my parents there was no running water, sewerage, electricity or heating other than a large fireplace and a well! The previous owners had moved out in in the 1970's. After extensive refurbishment in 1990, the cottage was re-born with 3 ensuite bedrooms and all modern conveniences, including a swimming pool. 20 years later in 2010, a further major rebuilding project updated the infrastructure and roof, and added two further bedrooms, a family bathroom and a huge 49 sq m kitchen/dining space with an outdoor terrace 'room'. The idea behind Petit Soyc was to create a well equipped and easily accessible retreat where we could escape to, quickly relax, and slow down from the frenetic pace of our normal lives. Whilst mobile phones and satellite TV can keep you in touch with reality - we urge you to switch them off and savour the slow pace of life of this region. As Jamie Oliver commented in his TV programme on the area ('Jamie does the Pyrenees') - the locals are not rich, but they live like kings! If you like great local french food and wine - this is the area for you. 49 square metre Kitchen/Dining are - extremely well equipped. Canoe/Kayak hire on the Aveyron is available nearby at St Antonin Noble-Val and suitable for all abilities. 10m x 5m fenced, (Heated at extra cost). Pool heating available at extra cost. Away from it all in the hills of the French Midi-Pyrenees between Montauban and Cahors. Very private pool (10m x 5m) and multiple terraces with the nearest neighbours 500m away. The pool is fenced to comply with the French child safety regulations applying to all rental properties. The cottage is surrounded by fields on all sides. Toulouse airport is approximatley 1 hours drive, and a car is essential. Local shops are a short drive away in Vazerac (5 minutes) and Castelnau-Montratier (10 minutes). Cahors and Montauban hypermarkets, (and traditional markets twice weekly) are 30 minutes drive. Although driveable in 8 hours from Caen, we recommend breaking the journey overnight from the Channel ports. Golf: Golf des Roucous is 5 miles away and open to 'pay and play'. Ski: The ski resorts of the French and Andorran Pyrénées are approximately 150 miles away.